Squeaky Clean Soap needed a vintage-inspired packaging to highlight nostalgia and a cheeky sense of humor that included hand-drawn lettering and illustration. Vintage packaging inspiration and mood board was the starting place, with elements drawn from older packaging that spoke to Squeaky Clean’s brand. Several hand-drawn sketches were created of possible directions, and then the chosen sketch was hand-drawn and hand-lettered and inked on paper. A custom hand-drawn pattern was also created to use as an interior wrap for the soap within the sleeve. All the hand-drawn elements were scanned in and vectorized, and colorized using blues and greens to evoke a clean and squeaky mood. The final sleeve was printed on a recycled, lightly speckled beige stock to hearken back to the old vintage packaging we drew inspiration from. This project was definitely a fun way to keep my cheeks clean. Initial sketches based on vintage inspiration, and then ideas for packaging design. Final original inked pieces for packaging, and vector versions of original drawings. 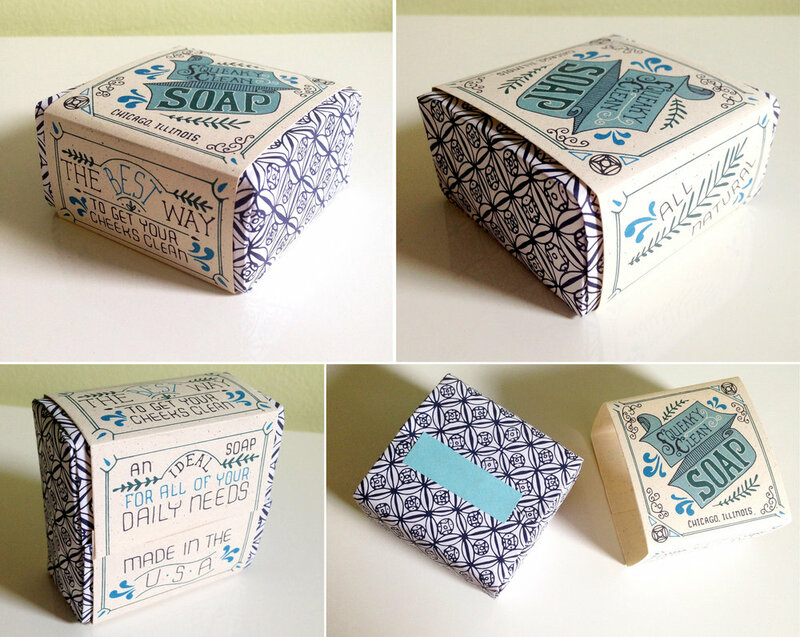 Various photos of finished soap packaging.